This stunning example of the Audi Q3 is fitted with the S-Line styling pack which features an upgraded body and part leather S-Line seats. Included with this Q3 are Satellite Navigation, Parking Sensors for the front and rear, DAB Digital Radio, Bluetooth telephone and media use, Cruise Control with a speed limiter, a multi function S-Line Steering Wheel with paddle shifters and an automatic Start/Stop system.. Also featured on this Q3 are dual zone Climate Control, Drinks Holders, a front central Arm Rest and an MP3 compatible CD Player. This car has been well loved and maintained by its only owner. 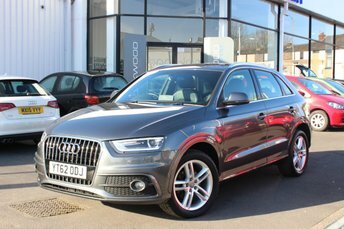 This fantastic example of the Audi Q3 is fitted with the S-Line styling pack which features an upgraded body and part leather S-Line seats. Included with this Q3 are Satellite Navigation, Bluetooth telephone and media use, dual zone Climate Control, Parking Sensors, an automatic Start/Stop system, FM Radio, an MP3 compatible CD Player, a front central Arm Rest and Drinks Holders. This car has been well looked after and maintained with service. Compact practicality is what the Audi Q3 is all about. This SUV boasts coupé-like styling, an elevated driving position, plenty of space within the cabin plus high ground clearance. Whether you're off on the school run or tackling a dirt track in the middle of the country, this practical, compact SUV will get you to your destination safely and in style. 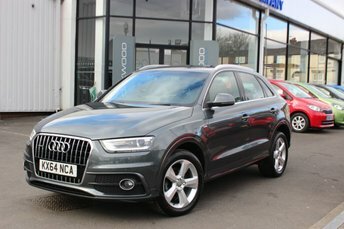 Find out more by viewing the complete range of used Audi Q3 models for sale in Stockport here on the website. You can also contact a member of the team at Oakwood Motor Company Ltd if you'd like further details or are ready to arrange a test drive. Rest assured that all of our vehicles are inspected before arriving on the forecourt, meaning you can buy in confidence.